There are hundreds of options for gas cooktops and rangetops. You will and should look at burner output, simmer and configuration for features as price. Then you will Google/Yelp the store to see who will offer the best sales/post sales experience. Perhaps you will read some blogs like Wirecutter or Consumer Reports to see some testing. Which Gas Cooktop/Rangetop Should I Buy? However, one critical part of your search should be reliability. You want to see how these products last in your house, and there is no data until now. Last year, we logged 34,687 service calls, about 15% more than the 30,000 registered the previous year and have developed metrics of reliability between brands. In this article, you will learn about the most reliable cooktops and rangetops, as well as reliability calculated to the exact percentage. First, you must know the difference between a cooktop and rangetop. Imagine your new kitchen. Its almost done. You have (let me guess) gray counters, a beautiful white tile, some dark floors, and gleaming stainless appliances as well as stainless faucets and decorative hardware. It's all going great until your contractor unwrapped the rangetop when he planned a cooktop or vice versa. You now have a significant problem, because the installation is completely different. These terms are used interchangeably in our business and should not. A rangetop is taller and installs on the cabinet. A cooktop mounts to a countertop. 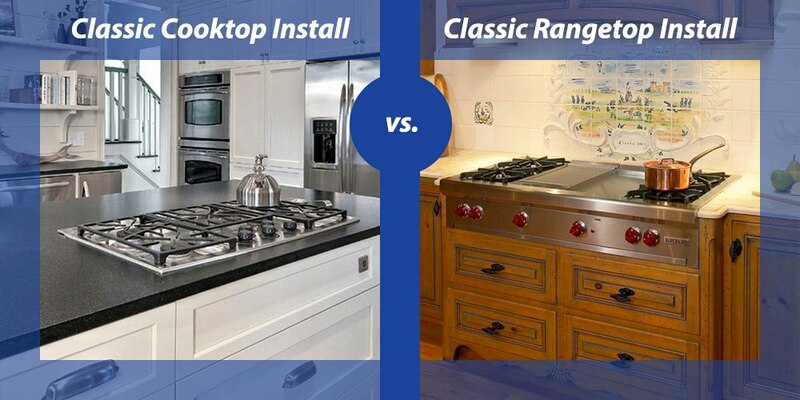 Think of a rangetop as the top of a pro range and a cooktop as the top of a regular gas range. Cooktop: 1 or 2 high output burners with a portable griddle and no ability for grills or Frenchtops. Cooktops will be $700-1500 cheaper. Now let's talk reliability. This is why you are here. We have 30 service techs and will have 40-45 by the end of the year. Every day, a tech will be in 6-12 homes five days a week with another 150 calls on Saturday. In 2018, we logged 34,687 service calls. For 12 months, the sales are then divided into service calls for the percentage and then compared against other brands. Its effective for us, because we can see patterns of unreliable products and stay away from unreliable brands. You now also have an accurate measure of the reliability of what you are about to purchase (or not after reading this article). Let's look at cooktops first. The reliability for all appliances was 13.4% last year, and cooktops are almost in line at 14.36%. You may think this is high for essentially half an appliance, but our second most serviced part for all appliances is ignitors. A cooktop is just ignitors and burners, so it makes sense. Secondly, appliances are split between highly serviced products like refrigerators and wall ovens versus less repaired products like hoods, disposers, and washers. Cooking is in the middle. It looks like Bosch has the most reliable cooktop. KitchenAid is sold mostly to builders, so the tenant/condo owner may not be calling us for service. Wolf, Jenn-Air, and Thermador are also worth considering based on the numbers. The average rangetop requires more service as expected because rangetops have higher BTU burners and more of them. The average 36-inch rangetop will have six burners versus 5 for a comparable cooktop. It's hard to make a specific recommendation because they are so statistically close. Buy this one on features or package rebate opportunities within each brand. From reliability stats, it's hard to know. The other side of reliability is what brands are best when there is an issue. You would have to inquire in your part of the country because the answer is different almost by region. In Massachusetts, Bosch/Thermador, Wolf, and Jenn-Air are the best for parts in technical support, especially in premium appliances. Now you know reliability percentages for gas cooktops and rangetops, the other part of your shopping should be for service and who can provide it. Unfortunately, appliances break statistically more than ever. In the whole kitchen, you will need service statistically within a year. You will also need to find a company to fix issues and not just sell you products. What is the Best Gas Cooktop? There is no best gas cooktop for every aspect of cooking. We cover this more extensively in this article Best Gas Cooktops. Short version: Thermador has the best simmer, BlueStar is the most powerful with Wolf and Jenn-Air having decent overall products. What is the best Downdraft for Gas Cooking? You have two types: Jenn-Air has theirs built into the middle for better proximity to all burners, but it lacks CFM at only 350. Every brand manufactures a downdraft for behind the cooktop at 600-1000 CFM. Downdrafts are limited and should be last resort options just because they lack the capture area to chamber smoke. Serious cooks should only buy hoods. What is better induction or gas? For boiling and simmering, induction is the fastest. However, induction cannot grill or griddle effectively. You also need metal pots for the magnets for induction cooking to work. 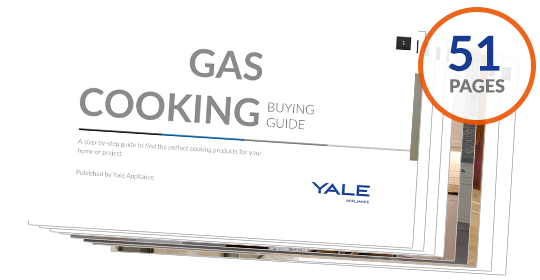 Get the Yale Gas Cooking Buying Guide with features, specs, and inside buying tips to all the brands. Well over 500,000 people have read a Yale Guide.